Jamie Waylett on July 16, 2009 after his first brush-in with the law. He was charged with growing 10 cannabis plants. 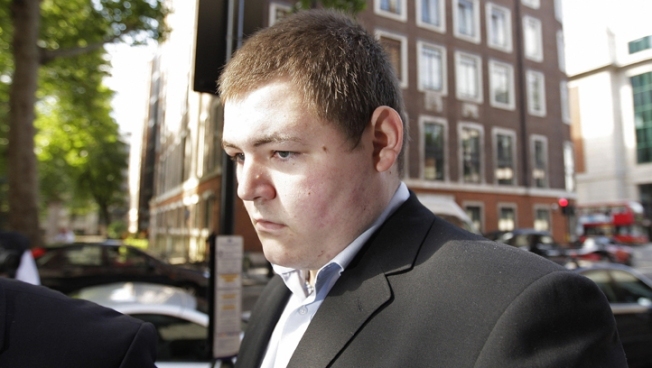 London-native Jamie Waylett, who portrayed Slytherin bully Vincent Crabbe in six “Harry Potter” films was sentenced to two years in prison after being found guilty of violent disorder and possession of stolen property at London's Wood Green Crown Court on Tuesday, the Press Association reported. During last summer’s riots in London, Waylett was caught with a small gang on closed circuit television drinking from a bottle of champagne that was stolen earlier. He was later pictured holding a petrol bomb. He was cleared of charges of intending to destroy or damage property. During sentencing, Waylett looked markedly different from his “Potter” character, with a shaved head and a goatee. He will be eligible for release after a year in jail. Unlike several of the other young actors in the Harry Potter franchise, Waylett’s career subsequently ended after the series concluded. The Harry potter films were the only ones the 22-year-old ever appeared in. According to his biography on the Internet Movie Database, he was hit by car at 9 and spent three days in intensive care- doctors then feared he’d develop brain damage. After a blood transfusion, his condition improved. Waylett has a previous conviction for cannabis possession.